These 10 conversation starters (or journaling prompts) will help you let go with more ease. 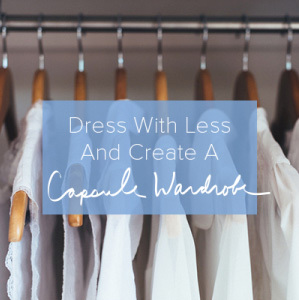 With all of the focus around minimalism, simplicity, decluttering, and capsule wardrobes, it’s easy to believe that a simple life is the dream, but a simple life is not the end goal. 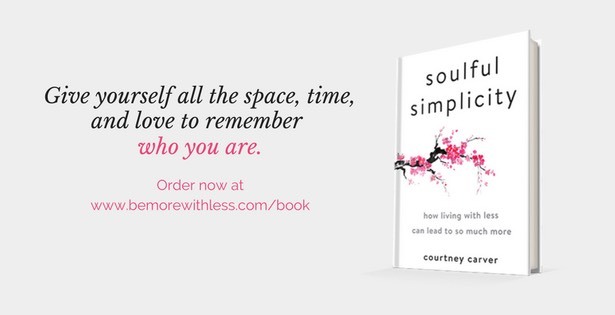 We don’t remove clutter, reduce stress, and boycott busyness to have a simple life. We do it to have a life. Letting go doesn’t come naturally for most of us, but there are some things we can do to make it easier. If you are struggling to let go of something or to declutter your stuff, take a step back. Maybe you’ve decluttered enough, or this isn’t the right time. Instead of running yourself down cleaning and decluttering, rest and take care of yourself. You’ll make better decisions when you feel well. If you’ve lost someone close to you and feel pressured to declutter their things, pause. Take care of yourself first. You’ve recently let go of a lot of stuff. Maybe it’s time to stop decluttering and appreciate the new space you’ve created. If this is the right time, but you don’t know where to start consider these 10 questions to help you let go. Use these questions as journaling prompts or as conversation starters if you are decluttering with someone else. Dig deeper with more questions here. 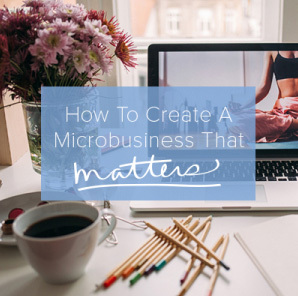 Remember the goal isn’t a clean countertop, organized book shelf or even a simple life. You want to get your life back and that may require some soul-searching. 1. Why do I want to declutter my life? Understand why you want to make a change, write it down, and use your why to motivate you when you don’t feel like decluttering, or when you lose motivation. 2. What are the most stressful areas of my life? Sometimes we only think of clutter as stuff in our home, but often we find clutter in our finances, calendars, to-do lists, and other areas. Determining the most stressful area may give you some direction in terms of where to start. 3. How do I really want to spend my time? Because we are so busy, we don’t often take the time to ask this question but it’s an important one. Do you want to spend the time you aren’t working and taking care of your family buying new things and taking care of your stuff, or do you want to spend it in other ways? 4. Would I buy this today? As you are decluttering, ask yourself, would I buy this today? If the answer is no, you can let it go. Take it a step further and add up what you’ve spent on the items you wear (clothes, shoes, jewelry, accessories) over the last five-ten years. What would you do with that money if you had it all back today? 5. Do I need help or really good music? If you are completely overwhelmed and unmotivated, decide what you need to move forward. Maybe you need help from a friend or a professional, or maybe you just need some really good music and a big glass of water. 6. Do I really need more than one? Be honest with yourself. Do you need more than one set of measuring cups/spoons? Sunglasses? Purse? Wallet? Pair of gloves? The items and answers will be different for everyone, but it can be a delight to discover that one is enough. 7. Am I holding on “just in case”? The just in case excuse for holding on is a messy combination of fear and procrastination. We hold on because we aren’t quite ready to let go but we rarely use or enjoy the just in case stuff we keep. Take a look in the back of your closet, in the junk drawer, under the sink or in boxes in the garage or attic and it’s clear that just in case means never. 8. Do I own this for the life I have or the life I want? The aspirational ownership struggle is real. If you aren’t enjoying and using the things you own, perhaps you purchased them for the kind of life you wish you had, or for a life you used to have, or for a life you want people to think you have. Consider how you might be more present and engaged in your real life if you got rid of those things. 9. Do I need it right now? While you are decluttering, slow the inflow too. Stop buying things you want or think you need. Pause and ask the question, “do I need it right now?” If you can, wait 30 days before you buy it. Chances are your interest will fade. 10. Is there another void I am trying to fill? As we declutter and let go of stuff, busyness, mind spinning and heartache, things may feel empty at first. And empty can hurt. So we fill the spaces to relieve the pain. The answers you are looking for are often in the space (or emptiness) in our homes and on our calendars if we are willing to ask the questions and listen. 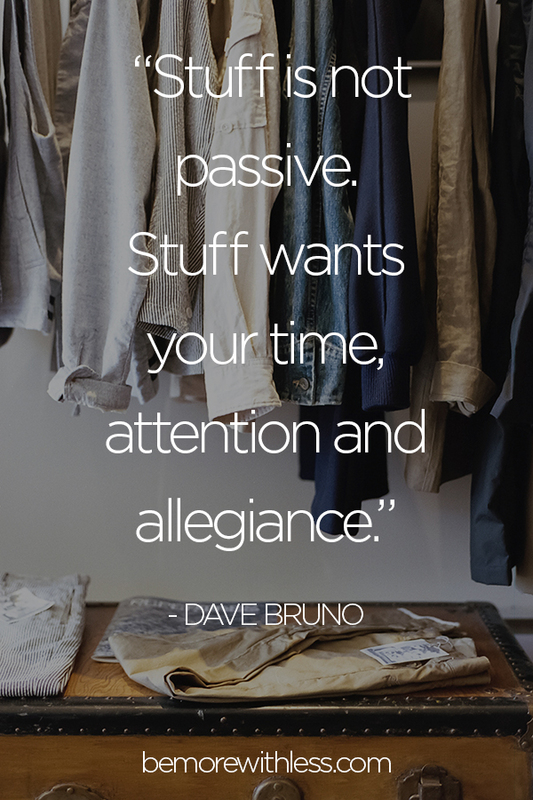 As author Dave Bruno says, “Stuff is not passive. Stuff wants your time, attention and allegiance.” Luckily, you get to choose what will get your time, attention and allegiance. I have a feeling it’s not going to be new stuff to store. Tomorrow (1/31) is the LAST day of the very LAST year of A Simple Year. If you are interested in joining A Simple Year, tomorrow is the very last day to join the very last year. Registration closes (forever) on January 31st. I recorded a webinar last week giving an overview and answering questions about everything from what topics we’ll cover, to the Facebook group, to our refund policy. You can watch the replay here. Learn more about our contributors and monthly topics and join here. Wow! This is a wonderful list!!! I am going to write down all the questions in a notebook and give serious thought to the answers. I think it will greatly help in my final layers of clutter! Thank you, Courtney!